I’ll admit, I have a bit of a sweet tooth. I always have. As I’ve gotten older I’ve learned some self discipline and will allow myself a treat or two during the week, but even then, sometimes I go a little overboard with my treat and I may have a couple of helpings (like the snickerdoodles we made last week…I think I ate six in one day). And that definitely happens when I make caramel or peanut butter popcorn. I think I end up eating half of it myself and who knows, I might even be able to polish off an entire thing, but because I have to share it with so many people, I haven’t been able to test out that theory :); and that’s a good thing. It’s a good thing we have so many family members because it requires me to share :). 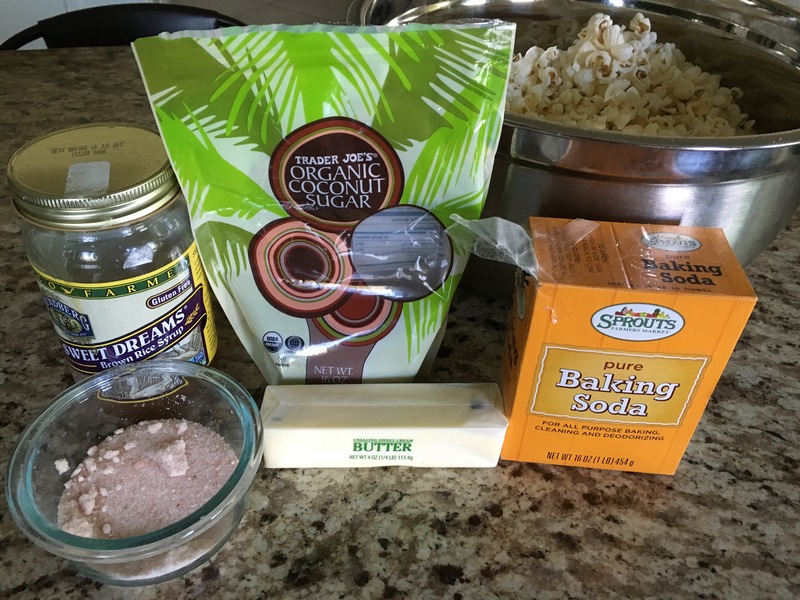 These are the ingredients: air popped popcorn, coconut sugar, brown rice syrup, butter, salt and baking soda. Combine butter, coconut sugar, syrup and salt in a medium saucepan. Bring to a boil and allow to boil for 2 minutes, stirring occasionally. I watch this pretty closely because I do not want this cooking too long because I like my caramel corn to be more like a sticky caramel coating, not the hard, crunchy kind. Remove from heat and stir in baking soda. 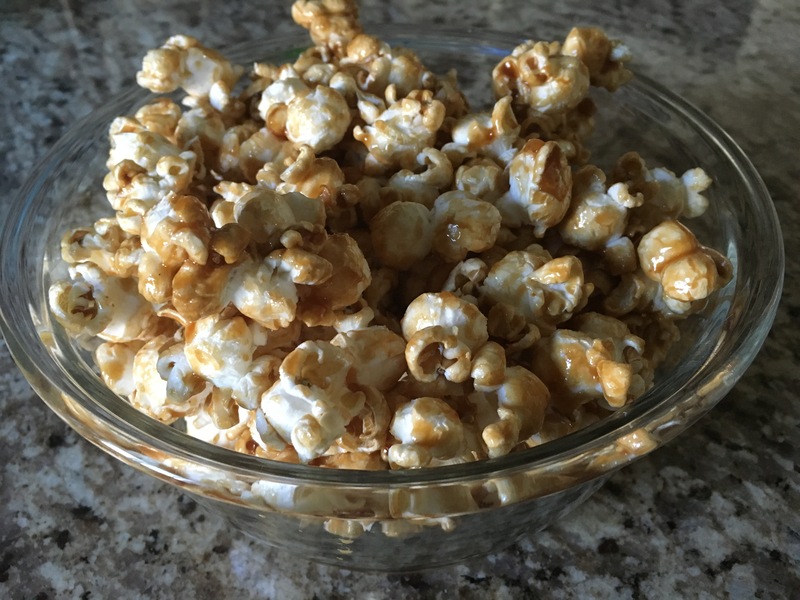 Immediately pour over your popped popcorn in a large mixing bowl, and stir together. Allow it to cool for a minute before you give it a try so it doesn’t burn your mouth. Combine butter, coconut sugar, syrup and salt in a medium saucepan. Bring to a boil and allow to boil for 2 minutes, stirring occasionally. Remove from heat and stir in baking soda. Pour over popped popcorn in a large mixing bowl and stir to combine. 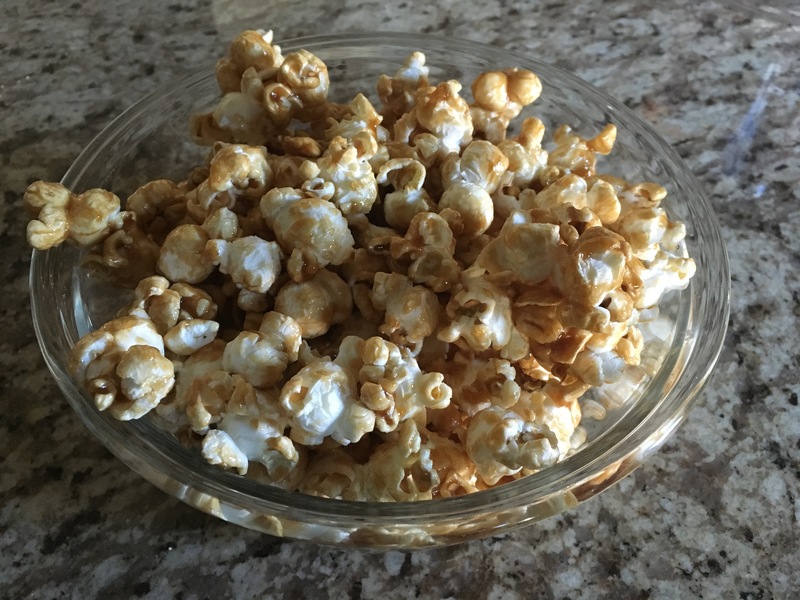 *this is not a hard and crunchy caramel corn. Although I’m not vegan or gluten-free, I do a lot less dairy than most because my stomach can’t handle too much, and if you’ve ever read The China Study, which is the most comprehensive study ever done on nutrition, you’ll know that cutting down on all animal products is a good thing (and I didn’t say cutting out, but cutting down. Should be less than 10% of your diet). 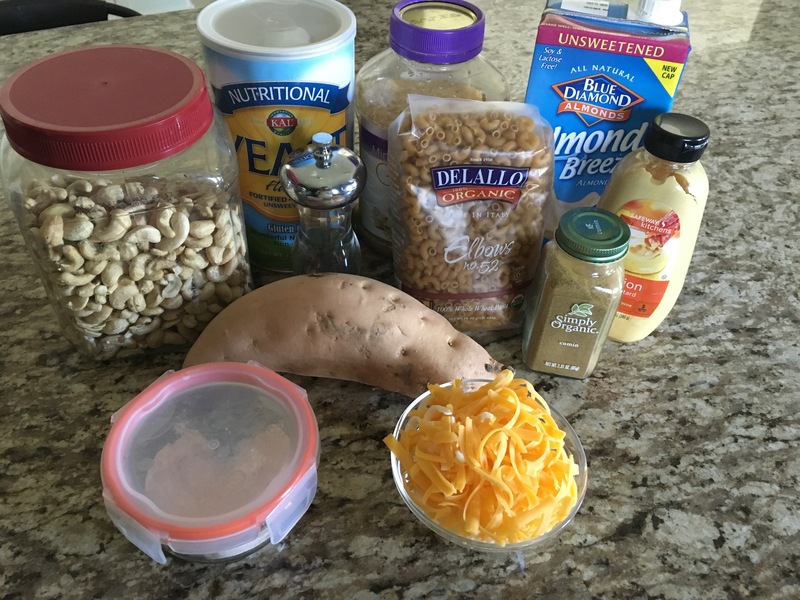 So I love that I can get the creaminess from this recipe from cashews and sweet potato and almond milk, all blended together, but then I use a little bit of cheddar cheese (only 1 cup), but you can always use the dairy-free cheese as well for the vegan version. You’ll want to start off by cooking your pasta elbows, gluten-free or not(I used whole wheat), and peeling and cooking your sweet potato in the microwave for 6 minutes. Or you can cook it in the oven at 400 degrees for almost an hour, but if you do it that way, don’t peel it before hand, just wait for it to cool and slip the skin off. Once the pasta is done, drain the water, place them in a large mixing bowl, drizzle a little olive oil over top and give it a stir so they don’t stick together. Set that aside and you’ll combine the rest of your ingredients in a blender and blend until it’s smooth. If it’s too thick and your blender is having difficulty blending, just add a little more milk about 1/4 c at a time, giving it a stir and then blending again. 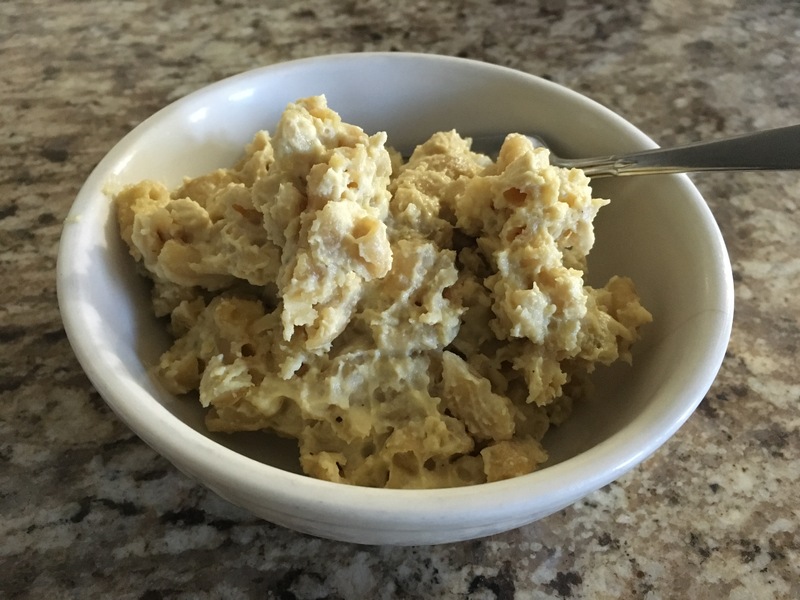 Once it’s all creamy, dump it over your macaroni noodles and stir to combine. 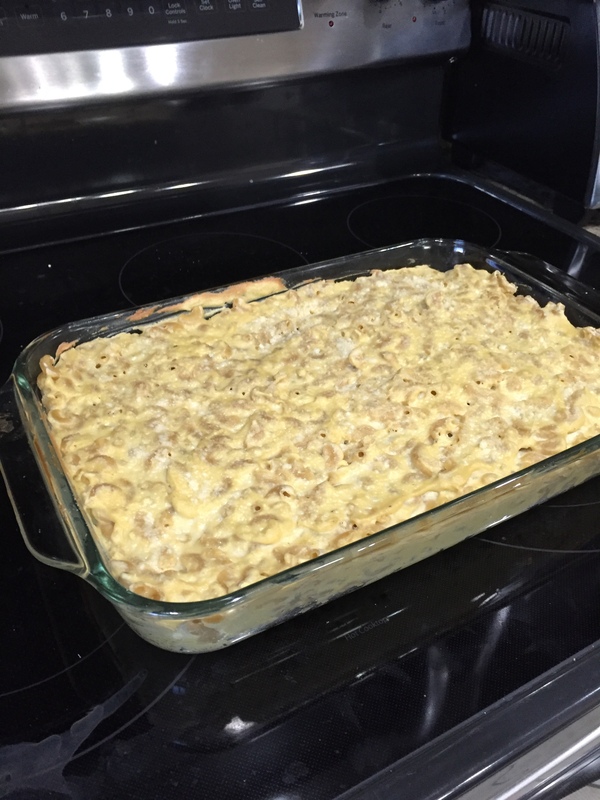 Grease a 9×13 pan (I smear coconut oil over the whole inside of the pan) and then dump your mac and cheese inside and spread it even. Bake for 15-20 minutes at 400 degrees. Cook noodles according to directions on package. Meanwhile, peel the sweet potato and cook in the microwave for 6 minutes (or in the oven, unpeeled, at 400 degrees for 1 hour; can do this before hand). 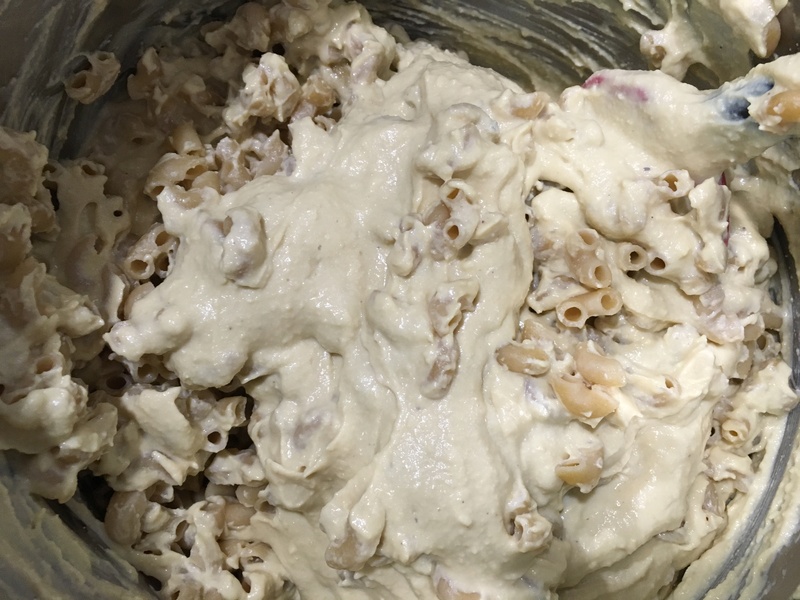 Drain noodles, dump back into your pot, drizzle with a little olive oil and mix so they don’t stick together. Set aside. Preheat the oven to 400 degrees. In a blendtec or food processor, add almond milk first and then all the other ingredients and mix until a creamy consistency. If you need to add more milk so your blender won’t burn out from the thickness, add 1/4 cup at a time. Pour over your noodles in the pot and stir to combine. 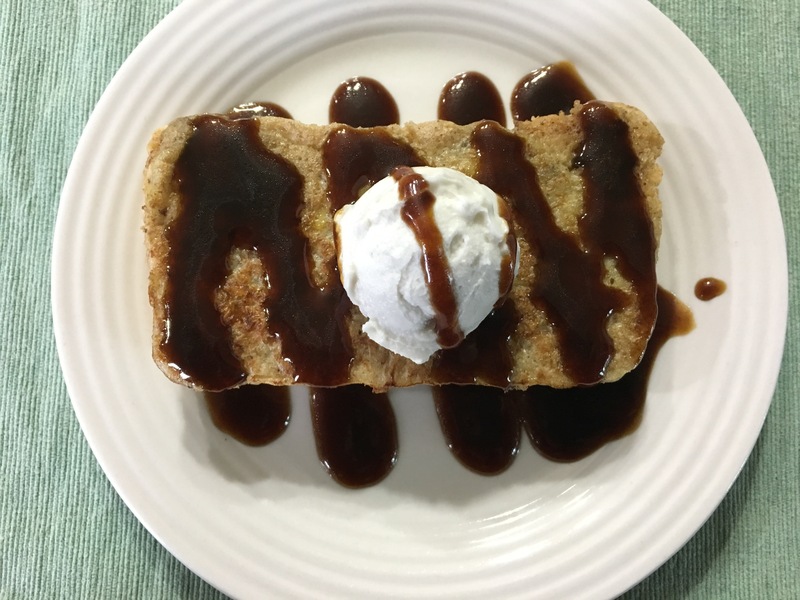 This is another Chef Brad recipe. 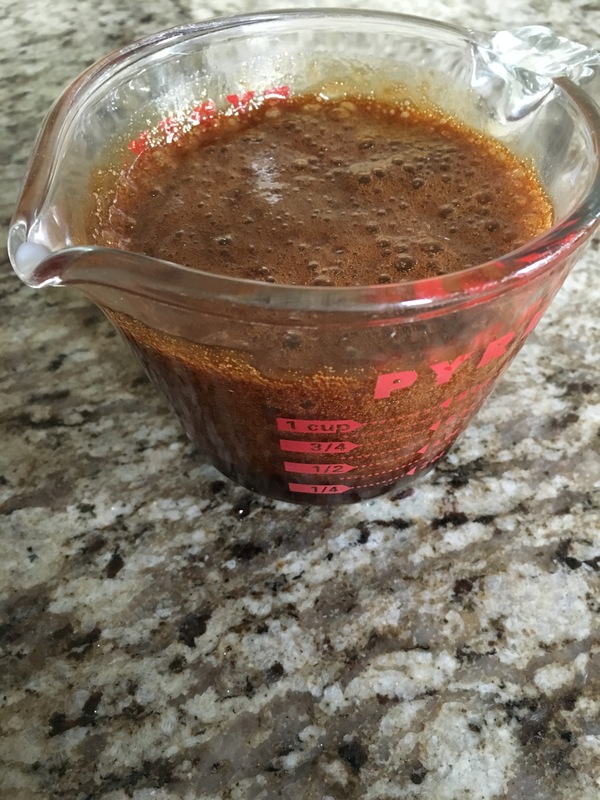 I know it looks like chocolate, and in fact, my 4 year old calls this the ‘chocolate syrup’, but there’s not chocolate in this recipe; the dark color comes from coconut sugar which is a very dark brown. I love that this buttermilk syrup is made from coconut sugar; it’s still super yummy but coconut sugar doesn’t have the same impact on your blood sugar as normal sugar which is nice. Pictured I have my vanilla coconut sugar (right) and my plain old coconut sugar (left), both of which would work perfect for this recipe. 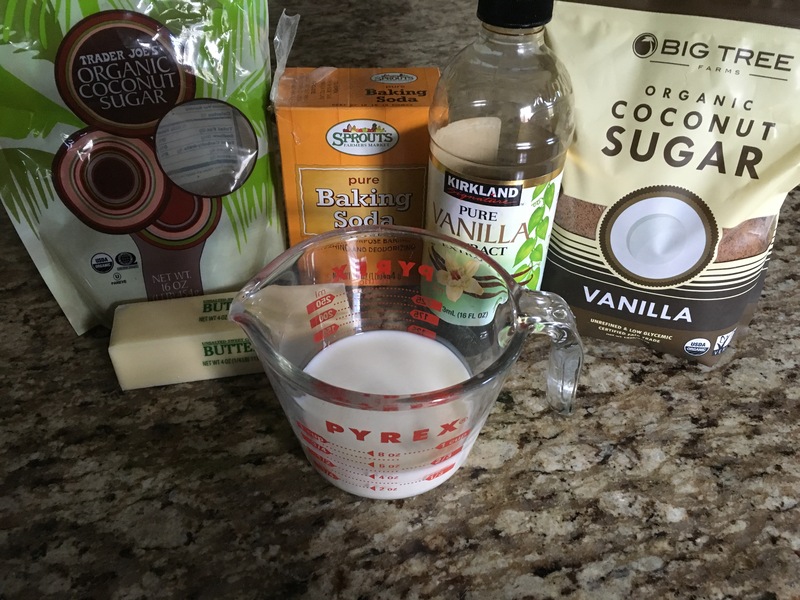 I normally just use the plain coconut sugar but the vanilla was on sale so I gave it a try. You’re going to melt your butter in a medium/large saucepan over medium high heat(do not use a smaller saucepan as it bubbles and rises and you’d have a big mess on your hands). Then you’ll add in your sugar, butter milk and vanilla and bring it to a boil. 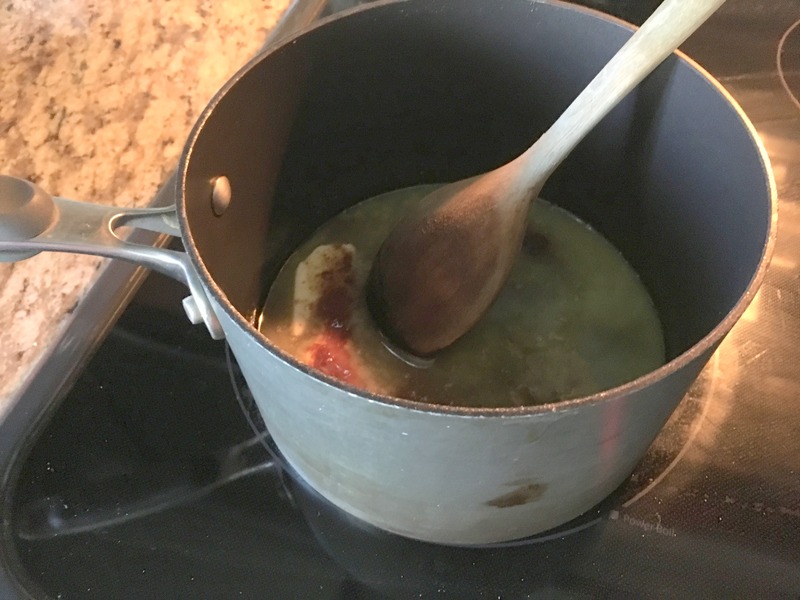 Turn the heat down and simmer it for a couple of minutes so it can thicken slightly, then remove from heat and stir in your baking soda and it’ll bubble and thicken a little more. 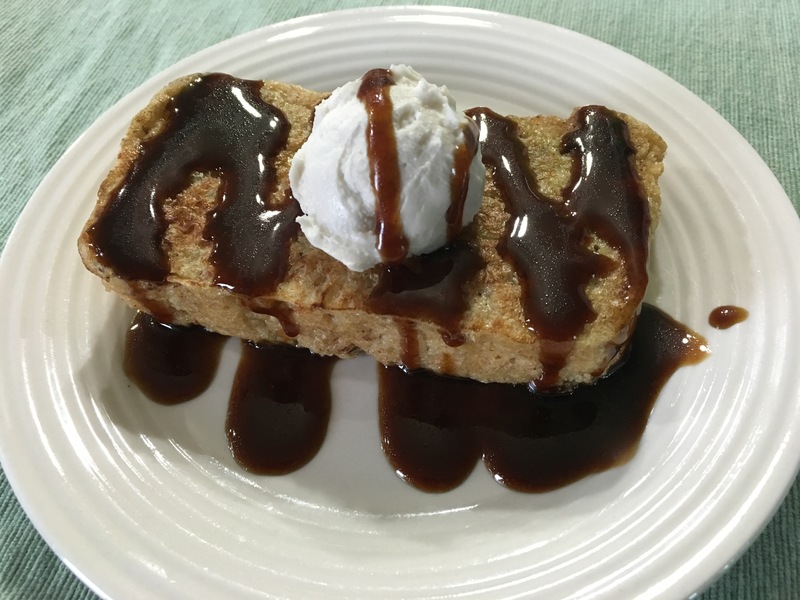 Serve this warm over pancakes, waffles, french toast etc (I put the link for the cottage cheese pancakes here but if you’d like to see more pancake recipes, I have a couple more under my recipe tab). It gets a little frothy at the top so give it a quick stir before you serve it. And if you want, you can add a little bit of coconut whipped cream, or any whipped cream for that matter. Melt butter in a medium saucepan or medium heat. Add buttermilk, coconut sugar, and vanilla and bring to a boil. Turn heat down and simmer for a couple of minutes. Remove from heat, stir in baking soda and serve warm over pancakes, waffles, or French Toast. 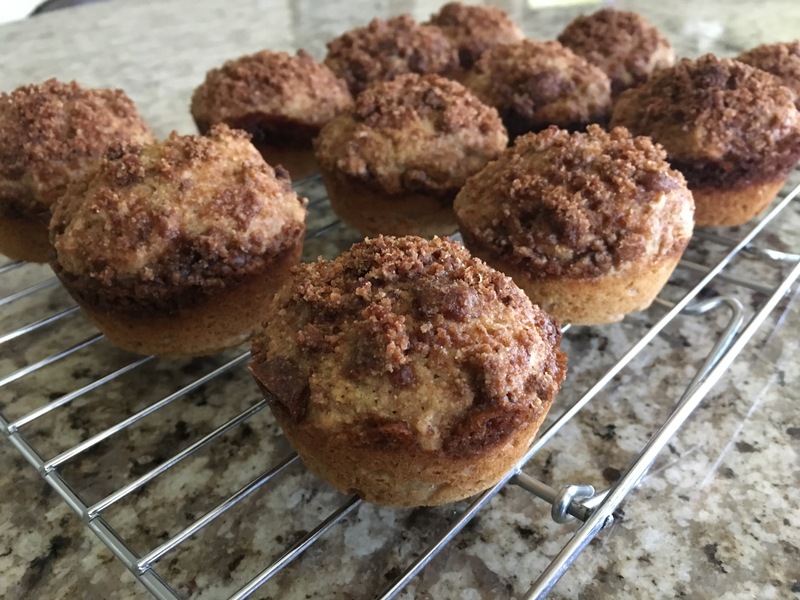 I frequently read recipe books and magazines; these applesauce muffins are a recipe I lightly adapted from the most recent Costco magazine, and they are so good! My husband ate 3 the day I made them, and he is not a big guy and doesn’t eat a whole lot. I love that the original recipe used applesauce and honey for the sweetener and fat/oil. I substituted half spelt and half whole wheat flour for the white flour in this recipe, but really you could do any combination. My tip for speeding up the muffin making process and for more even size muffins, is to use an ice cream scoop to divy out the batter. If you want to make any mini muffins, you can use a cookie dough scoop. 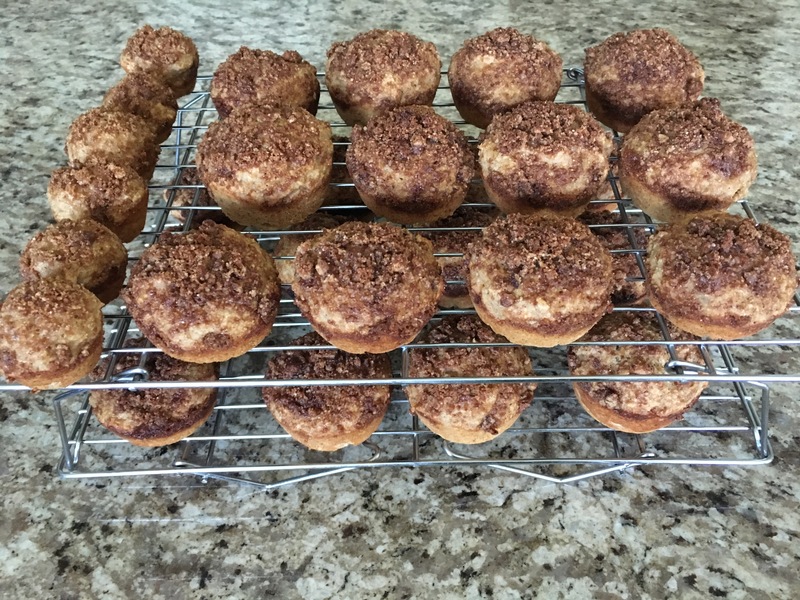 This recipe makes about a dozen muffins, which doesn’t seem worth the time and effort for my family of 7, so I double it which made 24 regular sized muffins plus half a dozen mini muffins. 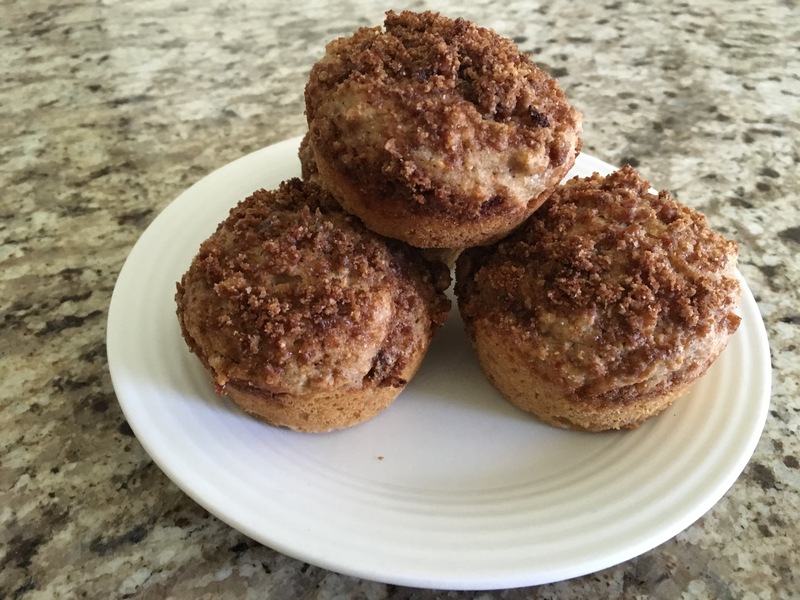 I use coconut sugar for the streusel, which is an unrefined sugar, and it’s amazing! Preheat oven to 400 degrees. 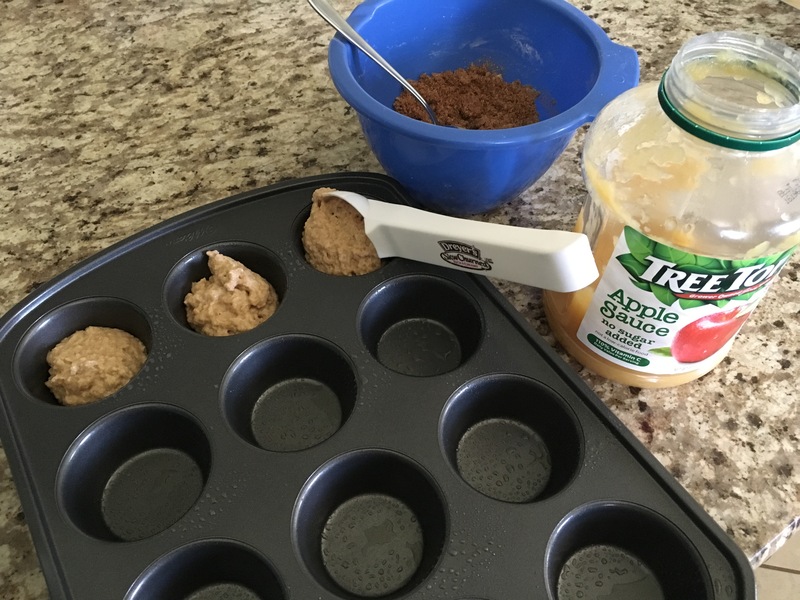 Grease a 12 count muffin tin or line with paper/silicone muffin liners. Mix the streusel ingredients together until small clumps form; set aside. 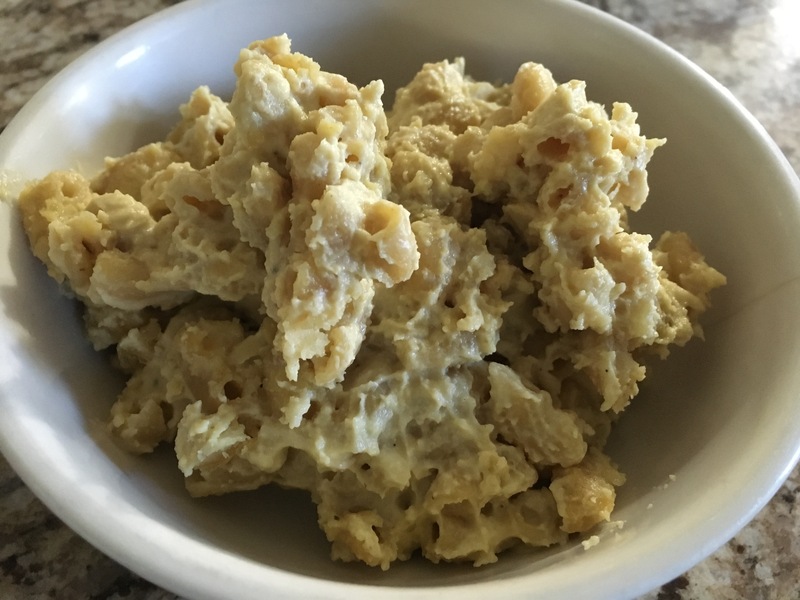 In a large bowl, whisk together the applesauce, egg and honey until combined. 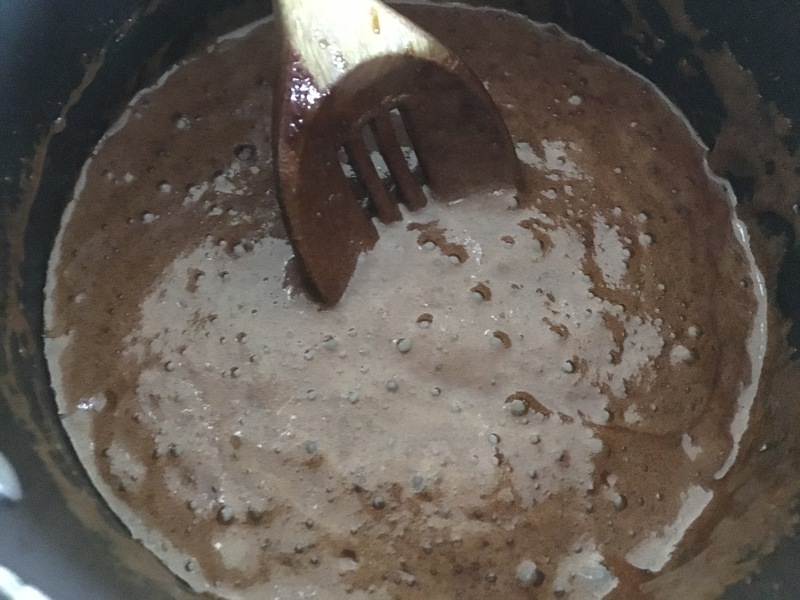 Add in the flour, nutmeg, cinnamon, allspice, salt and baking powder and stir to combine. 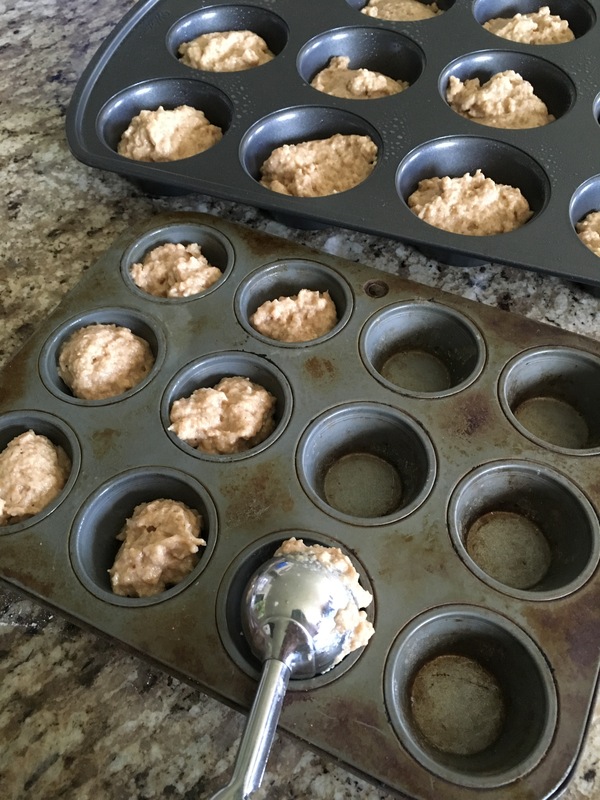 Pour the batter into the prepared muffin tin using an ice cream scoop. Sprinkle streusel topping over the batter and bake about 15 minutes or until toothpick inserted in middle, comes out clean. Carefully remove muffins to cooling rack (may need a knife or fork to help loosen muffin from around edges). 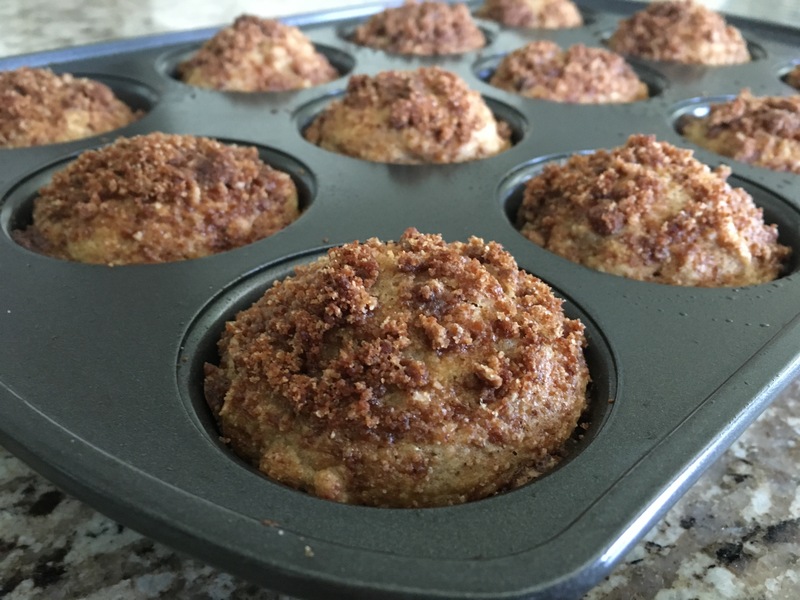 *If you want to make some mini muffins, decrease the baking time to 10 minutes, and I use a cookie scoop to fill those mini muffin cups.